إذا كنت تبحث عن فندق بموقع جيد في داروين، فقد وجدت ضالتك في Chalets on Woodlands Hotel . يجذب هذا الفندق ذو 4 نجوم، والذي يبعد 75 km فقط عن وسط المدينة و 65 km عن المطار، الكثير من الزوار سنوياً. يوفر الفندق بفضل موقعة الجيد وصولاً سهلاً إلى أهم معالم المدينة.
. إن الخدمات الممتازة وحسن الضيافة العالي في Chalets on Woodlands Hotel تجعل إقامتك تجربة لا تنسى. لضمان راحة ضيوفه، يقدم الفندق الخدمات التالية: واي فاي مجاني في جميع الغرف, تسجيل وصول/خروج سريع, واي فاي في المناطق العامة, صف السيارات, التوصيل من وإلى المطار . يمكن للنزلاء الاختيار من ضمن مجموعة من الغرف المصممة بعناية لتعكس جواً من الراحة، والتي يتجاوز عددها 3. يمكنك طلب اللائحة الكاملة للخدمات في الفندق ومن بينها صيد السمك, حديقة. مهما كانت أسبابك لزيارة داروين، فإن Chalets on Woodlands Hotel هو الخيار الأفضل لإقامة مثيرة وممتعة. We absolutely fell in love with this wonderful chalet. We chose this property based on previous reviews as it looked perfect as part of our 5 week tour around Oz. The chalet is set in 20 acres so you definitely feel part of the Woodlands. From the moment we arrived we knew we’d made the right choice. The genuine welcome from our hosts, Robert and Jill, set the tone for our 3 night stay. Warm and naturally friendly folk who helped us with our plans and we really enjoyed chatting to. The chalet was spotlessly clean, spacious and had everything we needed. Thoughtful items such as cereal and milk were also waiting us which we didn’t expect. Insect repellent was also provided (a first on our extensive travels!). We used the BBQ and sat on the terrace listening to the birds and insects in the evening - it was simply idyllic. There’s lots of storage in the large spacious bedroom and a very comfy large bed. We wish we’d spent more time in this beautiful place so we’ll return! Robert and Jill are good hosts and we followed their advice and enjoyed our stay at Woodlands. Comfortable, very clean and lovely hosts. Thoroughly enjoyed our stay in very comfortable surroundings, service was tremendous provided by wonderful hosts who did everything possible to ensure our stay was enjoyable without any issues. Will recommend the hotel to family and friends as an ideal place to stay. We will be back. apart from the room, not much. Relaxing stay and nice Location, clean, big rooms, the guys who owned the Hotel could not have been any friendlier. I stayed with my friend at Woodland Chalets for almost two weeks. I'm a city girl, but my friend enjoyed her stay because it was the "bush". The owners are helpful in trying to resolve any issues quickly. Staff gave us many pointers on which sights to see. If you like swimming (without crocodiles) go to Berry Springs. Only a short drive away from the Chalet. On the way there stop at "Crazy Farm" for a quick refresher. Breakfast is not available at the Woodland Chalet but a complete kitchen to do your own is in each chalet(no restaurant with this chalet). When taking the passenger only ferry (no cars) to Darwin remember that the no. 14 bus is FREE to get into the city of Darwin and also to return to the ferry. Darwin is a very nice and small place and easy to find your way around. People are very friendly. BUT EVERYTHING IS VERY EXPENSIVE!!!! 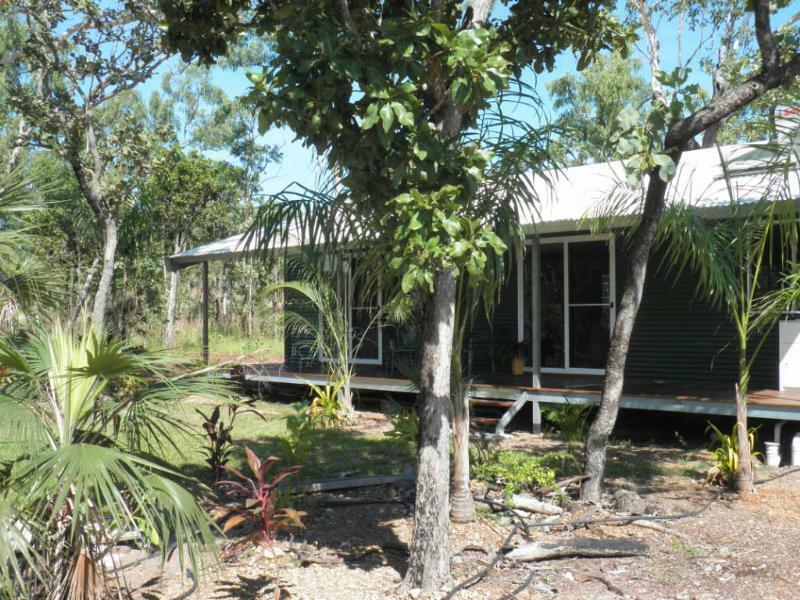 Very nice, would recommend it to someone who wanted to stay in the bush. Modern, fresh, quality fittings and attractive decor. we had a wonderful stay at chalets on woodlands. it is a relaxing place in peaceful surrounds. we were upgraded to the pandanus chalet which was more spacious. the lovely hosts made us feel very welcome and couldn't do enough to ensure we wanted for nothing, as well as giving useful advice about things to do in the area. the location is ideal for visits to berry springs, territory wildlife park and litchfield national park.